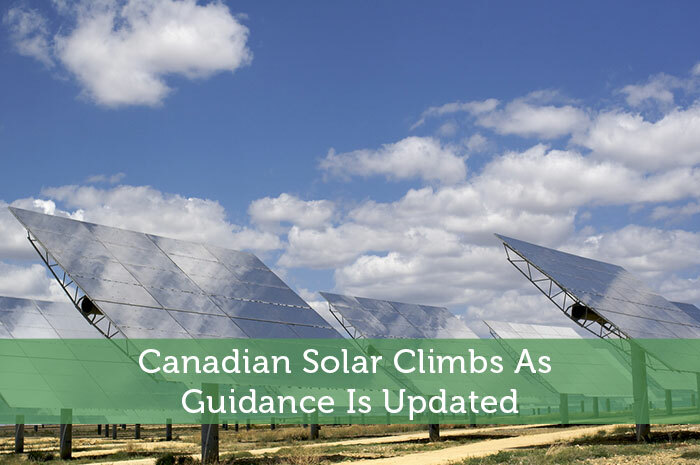 As mentioned above, Canadian Solar announced today that they have increased their guidance for Q3. Apparently demand for solar has risen at a faster pace than initially expected; giving investors something great to look forward to. Before today’s release, CSIQ was expecting to report revenue for the quarter between $570 and $620 million. However, as we get closer and closer to the earnings report date, things are changing. Now, the company is expecting for earnings to come in between $805 and $815 million for the quarter; which is a wide margin even from analyst expectations of $616.09 million. In their announcement, CSIQ also stated that they are expecting a higher volume of shipments to be reported. Before today’s announcement, the company expected that in the third quarter, they would be shipping between 970 MW and 1.02 GW. In today’s announcement, investors learned that the total expected shipments have been increased to between 1.18 GW and 1.23 GW. This comes as a major surprise to me as solar is in the energy sector and with declining oil prices, I would expect for earnings to be missed, not beat! While today’s news was great for CSIQ, it is also great news for the renewable energy space as a whole. The reality is that many investors, including myself have been looking at the incredibly low price of oil and saying “How can I expect to see gains in any aspect of the energy sector?” However, that opinion is slowly changing for me, as I’m sure is the case for many others. Essentially, the better than expected results are great for the solar, wind and water energy sector as a whole. What Can We Expect From CSIQ Moving Forward? Moving forward, I’m expecting to see overwhelmingly positive news out of CSIQ. The reality is that the big issue in energy is obviously not affecting the company as much as anyone expected it to. As demand for clean energy continues to climb, we are likely to see further growth in sales, better earnings, and of course improved movement in the value of the company’s stock. With that said, if you’re looking to get your hands on a stock that’s likely to grow, you may want to strongly consider taking a look into CSIQ. Where do you think CSIQ is headed and why? Let us know in the comments below! I am not sure I would share their enthusiasm, given the price of oil and gas being at such ludicrously low prices and expected surpluses in supplies suggests these prices will stay down. Can solar compete with $40/barrel oil?